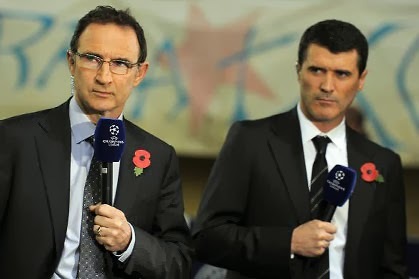 Martin O’Neill and Roy Keane. This was the year when hurling proved itself the greatest field game in the world as the mantle of greatness passed from one team to another, Sunday after Sunday, in the most dramatic championship of them all. It was the year when Kilkenny’s legends were exposed as mere mortals, the year when Dublin finally found their mojo with the small ball, the year when Henry Shefflin was sent off in a championship game. More than anything, though, it was the year when Clare’s shout was heard at Croke Park on All-Ireland final Sunday again, not once but twice. They needed a replay to finally see off Clare and take their place back at hurling’s top table but Davy Fitzgerald’s team did their manager and their county proud in that epic second game. Clare, probably, are the team of the year. At the start of the summer it looked like the All-Ireland crown would go to Donegal, Mayo or Dublin. By the end of 2013, Sam Maguire was back in the capital and Jim Gavin was the deserving winner of the Phillips Manager of the Year award. He got there, ahead of Davy Fitz, by winning the National Football League, the Leinster title and the All-Ireland, and all that in his first season in charge of the senior Dublin side. Gavin did change things around from the side that won the 2011 All-Ireland under Pat Gilroy. His team were a little more adventurous, a little more glamorous and a little more believing. As a result they were deserving winners of the September shoot-out as Mayo flattered to deceive once again, but Dublin deserved nothing more than Sam after overcoming arch rivals Kerry in the semifinals in what was the game of the century, never mind the game of the season. This time next year Dricco will be retired and his autobiography will be a contender for number one on the Christmas best-seller list. By then we might just appreciate him for the greatest Irish player of all time that he surely is. It wasn’t a great year for the Ireland legend, not least because his former national coach Warren Gatland dumped him to the stands for the third and decisive Lions test against Australia, a decision that still irks the Dubliner. Nor did Leinster or Ireland acquit themselves with any great panache over the course of the last 12 months as his provincial coach Joe Schmidt replaced his international coach Declan Kidney. But Dricco is still a genius. His Heineken Cup performance away to Northampton a week ago proved that. When he’s gone, we will miss him. Really miss him. I’d have given you decent odds on Martin O’Neill becoming Ireland boss by the end of the year if we’d met for a Christmas pint 12 months ago. I’d have given you any odds you wanted on Roy Keane joining him as his assistant manager. It’s not that O’Neill’s right to replace Trap was ever in any doubt. He was the man the FAI wanted when they appointed Steve Staunton in 2007, and his pedigree for the job is impeccable. What was implausible a year ago was the notion that Keane would work for the FAI, the notion that Keane would work as a number two and the notion that he would be work with some of the players, like Robbie Keane, that he previously branded as muppets. Well, Roy is now Ireland’s number two and so far, two friendlies into the relationship, it’s all going very well for O’Neill and Keane. They’ve yet to be tested of course, so the next 12 months is going to be more interesting than the last two for their reign. And anything can happen in Irish football – we’ve seen that at first hand these past few weeks. Trap is a nice man and he was a great football manager, but he should never have been in charge of the Irish team after the Euro 2012 humiliation in Poland. It’s easy to say that now, but the performances that followed against Germany, Austria and Sweden in the failed World Cup qualifiers were embarrassing to say the least. He eventually said Goodnight Vienna after the defeat away to Austria, but even before that game the Italian was adamant that he deserved a new contract. Thankfully the FAI, for once, saw sense. There’s a new management team on the merry-go-round and the honeymoon period is alive, alive o. For Trap, however, it is all over and not a day too soon. Arrivederci. Grazi. WeeMac finally won a tournament in 2013 when he lifted the Australian Open trophy earlier this month. He also provided more headlines on and off the course than probably any other Irish sportsman or woman this year. From his romantic interests to his booming legal battles to his Olympic tribulations, Rory just couldn’t stay out of the news at a time when his game was going through the ringer. Thankfully he looked back to his best as the New Year approached, but his end of season wish for privacy will fall on deaf ears. That’s the price of a $150 million sponsorship deal Rory, so get on with it. And get back to what you do best – playing golf. He has a smile as wide as the river Lee in his beloved Cork, and Rob Heffernan had the whole nation smiling with him when the gold medal arrived home from the 50 kilometer walk at the world championships in Moscow last August. It was only Ireland’s third ever gold medal at the world championships and the second for Cork as Heffernan followed Sonia O’Sullivan and Eamon Coghlan into the record books. His was a triumph for hard work and perseverance after heartache at previous world and Olympic Games and he deserves all the credit that has come his way since. A nephew of the great Stephen Roche and a first cousin to Nicolas, Martin hit the front page headlines not once but twice in 2013, quite an achievement for an Irish cyclist in the current sporting climate. Glory arrived first in March with a stage win and then overall victory in the Volta a Catalunya, not far from his home in the Catalonian town of Girona. In doing so he became only the second Irishman, after Sean Kelly, to win the renowned title. Months later he took a leaf out of Kelly and Roche’s book when he won a stage on the Tour de France. Martin’s victory on stage nine, ending a wait for an Irish win that went back to Roche’s stage 16 honour in 1992. Roche himself says there is more to come from Martin and he’d know. Aidan O’Brien is the king of the flat, but Mullins is now very definitely Ireland’s top jumps trainer after a hugely successful year. He posted the fastest 100 winners in a season at Fairyhouse on Sunday and was the man of the moment for the Irish at Cheltenham last March. The Cotswolds belonged to Mullins with five winners in the first two days, one of them a personal triumph as his son Patrick steered Back in Focus to victory in the John Oaksey Chase. Hurricane Fly, Champion Hurdle winner, was voted horse of the year back home and Mullins was definitely the trainer of the year. Ruby Walsh summed it up perfectly when he said most jockeys would be happy with 400 winners after the great McCoy passed the 4,000 winner mark for his career with victory aboard Mountain Tunes for JP McManus at Towcester in November. A pure born genius. Ireland enjoyed incredible success at the World Paralympic Games in Lyon in July, spearheaded by the dynamic duo of Michael McKillop and Jason Smyth. They won two gold medals apiece to cap a great games for an incredible Irish team a year after their triumphs at the London Olympics. Triple Crowns don’t come easy as the males who represent Ireland will tell you, so credit was given where credit was due back in February when a 30-3 win away to Scotland capped the achievement for the Irish ladies team. That the game was live on RTE television tells you how big it was. They went on to win the Grand Slam and see the job done.